I’ve been a bit snowed under with work related stuff, some of it rather exciting though! I’ve been flat chat organising customers and packaging for a small range of protein bars I will be selling in selected outlets in Melbourne (mostly gyms) as well as starting to make chocolates to sell. This got my creative juices flowing again and I even tackled my cousin’s twenty-first birthday cake … a gorgeous chocolate and hazelnut entremet. It took me a while, since my father passed away in August, to feel happy about baking and making chocolates. But I realised he’d not want me to stop doing what I love just because it reminds me of him so strongly. So I am all fired up again and trying to figure out how to make all the goodies I’ve been thinking of. Where have you been all my life???!!!! Bacon makes everything taste better (unless you happen to be vegetarian or vegan or whatever). Numerous, admittedly dodgy, studies like this one, have shown this to be true 😉 It certainly elicits an impassioned frenzy in a lot of people. I think it’s because it has umami. That special something that adds an extra flavour dimension to sweet dishes, as much as savoury. Yes, sweet dishes. I love bacon. What an all-rounder. If you still think it’s weird, just try it. I gave a mini doughnut to Mum and then had to fend her off so I could take some photos before she devoured them all. An instant convert. Are these the best Elvis proughnuts? Well, who knows? I haven’t spent anywhere near enough time with recipe testing to make that claim. But they are really good and very very moreish. The texture is fairly light but not as airy as I’d normally prefer for a baked doughnut. But this is an infinitesimally small trade-off because there is just no substitute for the fresh over-ripe banana in this recipe for its sweetness and full on banana flavour. It just sits so well with the punchy roasted peanut flour, neither overpowering the other. Do use roasted peanut flour for this recipe. PB2 just doesn’t cut it. Neither does freeze-dried banana for the fresh banana (tried it so trust me). You can certainly use banana or peanut flavoured casein instead of the unflavoured casein but take care as they tend to mess with the real flavours coming through. 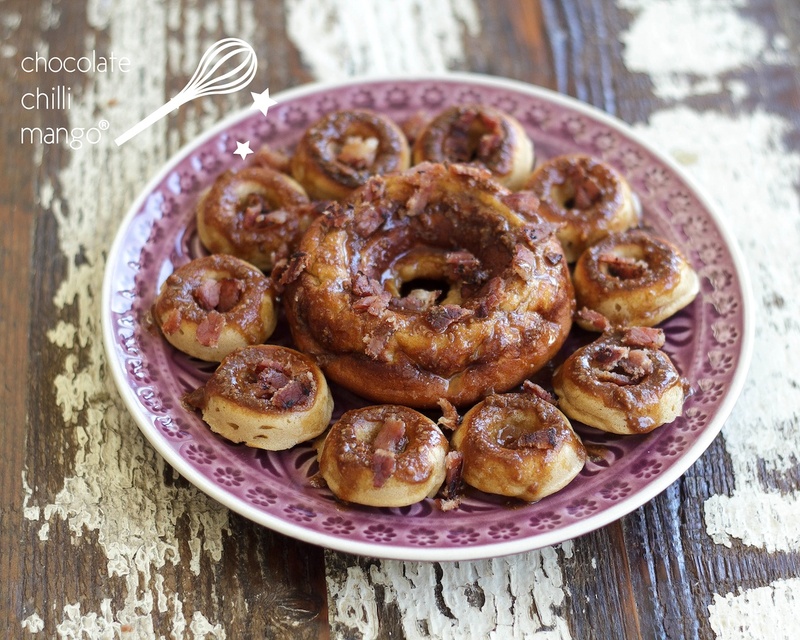 These proughnuts are brilliant unglazed … but awesome with the glaze and the crispy bacon on top. I have included the nutritional information below the recipe, as usual. Did I mention they are gluten-free and suitable for anyone with a fructose intolerance? You are welcome. Oh hey, if you want to keep up with what is happening here at Chocolate Chilli Mango and not miss out on some funky finds I share, follow me on Facebook, Twitter and Instagram. It’s a good way to have your say about what you would like to see on the blog and across social media from CCM. Click on the buttons at the top right hand side of the page! These doughnuts are not as light and airy in texture as I normally prefer them to be. This is due largely to the inclusion of a good quantity of fresh banana in the dough batter. However, the flavour is so fantastic, that I’m very happy with a slightly more chewy doughnut than usual. Make sure to use over-ripe banana for this recipe. It adds to the sweetness as well as a punchy banana flavour that complements the strong peanut flour. I like to use a roasted peanut flour for this recipe, for its more intense robust peanut flavour. Don’t be tempted to substitute PB2 as it won’t give as good a result! These proughnuts keep well for several days, if stored in an airtight tin. They are great warmed through, dunked in coffee or a bowl of yoghurt or milk, or whatever, if you choose not to glaze them. Glaze just before serving for the best flavour. The glaze keeps well in an airtight container in the refrigerator for up to a week. Pre-heat oven to 180°C (350°F). Lightly grease the doughnut pans, if required (not if using silicone) and set aside on a baking tray. Place the peanut flour, almond flour, casein powder, sweetener, salt, and baking powder in to the bowl of a food processor and process until the mixture is fine and silky. You don’t really need to do this step but I would highly recommend it as it will result in a much lighter, open and airy textured doughnut. I strongly recommend this step. Add the banana, whole egg, egg whites, and almond milk to the bowl. Process the batter until it is really smooth. Divide the batter evenly among the doughnut pans, filling them about two-thirds full. Bake for about 10 – 12 minutes, until the doughnuts are well risen and starting to colour. Don’t be tempted to overbake these. Remove from the oven and transfer the doughnuts to a wire rack to cool completely before glazing, if desired. 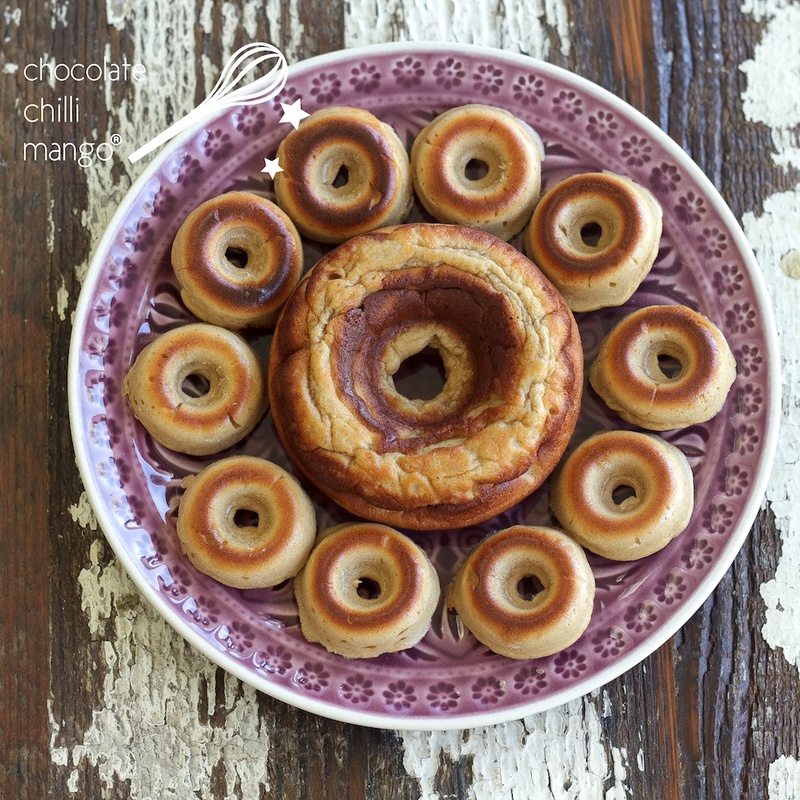 If baking mini doughnuts, check them at the 8 minute mark to see if they are cooked through. Grind the roasted peanuts and salt into a smooth peanut butter. Add the maple syrup and whisk lightly until smooth. It should still have a fairly runny consistency. When cool, drizzle the doughnuts with the glaze and sprinkle the crisp bacon on top to serve. * The yield for this recipe depends on the size of your doughnut pans. They can vary considerably in size between manufacturers. 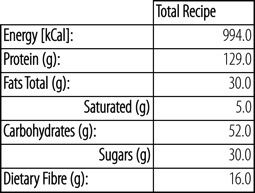 I am providing you with the macronutrient profile for the unglazed proughnuts and the Maple PB Glaze separately. You can then calculate the macronutrients per glazed proughnut based on the yield and how much glaze you like to use per proughnut. I have not included the macros for the crumbled bacon. Use your favourite bacon and simply add the appropriate macros accordingly.